In Flames’ tonal shift towards alternative metal has been taking place for some time now, with 2016’s Battles demonstrating their most dynamic leap yet towards a cleaner, more streamlined sound. 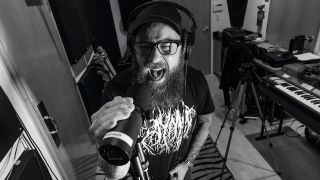 After gracing the biggest of stages with Five Finger Death Punch and Avenged Sevenfold on their last cycle, mild-mannered frontman Anders Fridén tells Hammer that we can expect a much more up-tempo experience from album number 13. So, Anders, how's the new record sounding? Battles was arguably your most melodic record to date, so can we assume this new one follows suit? Lyrically, what’s inspired you this time out? You’re currently without a permanent bassist as Peter Iwers left after the release of Battles. How has that impacted the recording for this new album? You’ve played some big stages on the last tour with the likes of Avenged Sevenfold, Five Finger Death Punch and the main stage of Download Festival. Are you feeling more inclined to write more arena-friendly tracks for this new record?